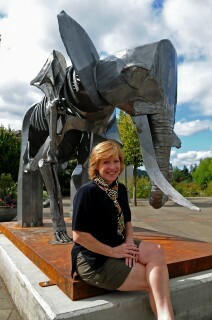 Alisa Roe with her sculpture, which now is on permanent display in Lake Oswego. Portland Community College students are famous for creating all sorts of things, from inventions to recipes to novels. But probably only one student, Alisa Roe, can take credit for creating an elephant. The Rock Creek student appeared in the Winter 2010 issue of PCC Communities in a feature about her work as a sculptor, and her crafting of an metal creation, “August Trunks,” which later was moved from Rock Creek to its present location, square in the heart of pedestrian-friendly Lake Oswego. Now comes word from The Lake Oswego Review that Roe’s pachyderm beat out four other works of art to become part of the city of Lake Oswego’s permanent collection, known as Gallery Without Walls. Roe’s elephant stands in a prominent spot, south of A Avenue on N. State St., and is visible from much of the city’s recently renovated downtown core. To see the Lake Oswego Review story, click here. For a copy of the PCC Communities story, click here.